- Our posts and references. All the artists we know of on this specialty are listed in our Index, with direct link on their Diccan's item. On summer 2014, we list some 20 artists. As for animation, this number does not cover the thousands of "artists" working anonymously in the industry. Games : A beautiful book for the images. You may be surprised by the small number of game specialists in diccan: around 1% of the list. Indeed, "artists" are enrolled by the hundreds in the computer games industry. But they are anonymous, like most of the workers in the film industry. And, in fact, the divide is deep between the two worlds. That's true also for the users (games, spectators). In few words : games consider art elitist (if not simply boring), and art considers games as vulgar, or just grassroot entertainment, devoid of the gratuitousness of artistic activity. When we look at the list of some 15 game artists listed in diccan, we find that most of them do not create games as such, but mostly use them in a derisive manner, or as a way to raise awareness on social issues, like surveillance. They are close to tactical media. Judge by yourself! - Musical games, see music. - Expressive processing and specially the book of [Wardrip-Frouin]. (Some artists may have been added in diccan since the writing of this article. Then give a look to our Index of the games authors). We give : the country, decade of first known digital work, level of fame, level of generativity, gender (X male, Y female, Z group or lack of data). Bookchin Natalie USA 1990 ** GG Y . Rather serious : understanding games. Clearly educational aims. Casanova Christina Spain 1990 * G Y Burlesque and mime. Crondon Brody USA 1990 * G X . Performance and games, post-traumatism and fantasy. Delappe Joseph France 2000 * G X. Tactical media, on the border of art and politics. Kim Hyung-Tae Korea 2010 * G Y . A powerful sense of the public reactions to the games. Le_Chevallier Martin France 2000 * G X . Surveillance and informing. Mealeay Alison United-Kingdom 2000 * G Y Feeling. Game? Mizuguchi Tetsuya Japan 2000 ** GGG X Games, graphically high. Nideffer Robert USA 1990 * GG X. Cerebral games. Regottaz Djeff France 2010 * G X . Games with a moral dimension. Schleiner Anne-Marie USA 2000 * G Y . Political engagement. Sellam Michael France 2000 * G X . Quite derisive. Viennot Eric France 1980 ** G X . Rather serious. - Interactivity and games, a lot in [Miller, 2014]. <What video games put into play. by Anaël Pigeat and Dork Zabuny (eds). A special issue of ArtPress2, quarterly no28. Paris, France. - Report on Enjmin 2012, game contest. on the Eric Legay's blog. - Interaction design for games see [Janet Murray]. 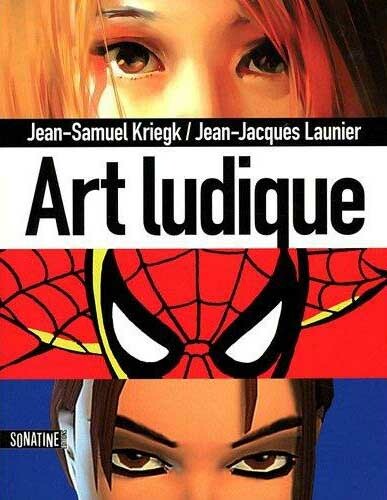 < Arte e Videogames. Neoludica 2011-2096, by Debora Ferrari and Luca Traini. Skira 2011. < Philosophie des jeux vidéo. by Mathieu Triclot. Paris, La Découverte, 2011. < [Triclot], [Berger-Lioret] pp 101, 187. < Videogames and Art. Edited by Candy Clarke and Grethe Mitchell. Intellect, Bristol, 2007. < Manuel d'écriture de jeux vidéo. by Jean-Yves Kerbrat. L'Harmattan 2005. - Jane McGonigal : Gaming can make a better world (video). - About relations between video games and cinema: Alexis Blanchet: Des pixels à Hollywood. Pix'nLove Editions 2010. < Digital Gameplay. Essays on the nexus of game and gamer. by Nate Garrelts (ed.) McFarland , Jefferson NC, 2005. < Handbook of Computer Game Studies . Joost Raessens et Jeffrey Goldstein (eds). MIT Press 2005. 451 pages A4 on 2 colums. Parts of the book: design, reception, games as an aesthetic phenomenon, as a cultural phenomenon, as a social phenomenon. - First bases for a French lexicon of games, by Hoël Berger and Pierre Berger.